There are now numerous reports that between two and seven people were shot at 5th Avenue and 34th Street near the Empire State Building around 9 this morning. The New York Post currently says only two were shot. But the Twitter feed NYScanner reports that seven people were shot in total, including the shooter, who was killed by police. Of the other six victims, five are reportedly stable and one is in serious condition. 10:00 AM EST: A witness described the shooter as a "young white guy" to local news station Fox 5. 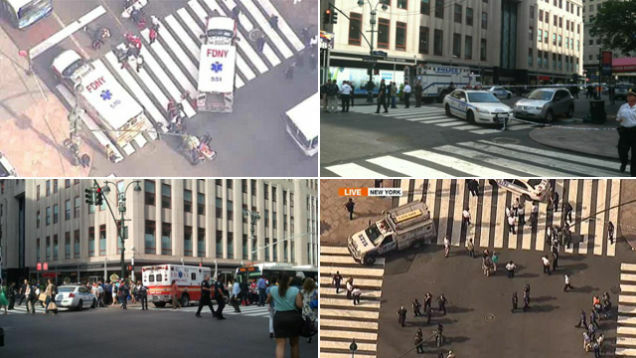 10:04 AM EST: NBC4 reports that the shooter was a disgruntled employee who worked in the Empire State Building. 10:09 AM EST: The New York Post says the shooting was the result of coworker dispute that turned violent. It's also reporting that 10 people were shot in total, though only two were killed: one innocent bystander and the shooter, who was killed by police. 10:23 AM EST: Reader Brooke R. works near the Empire State Building and sent in this photo, which shows police near a covered body. 10:39 AM EST: The New York Daily News reports that the shooter was "well-dressed," wearing a grey suit and carrying a briefcase. 10:42 AM EST: Pictures of the chaos via Twitter. 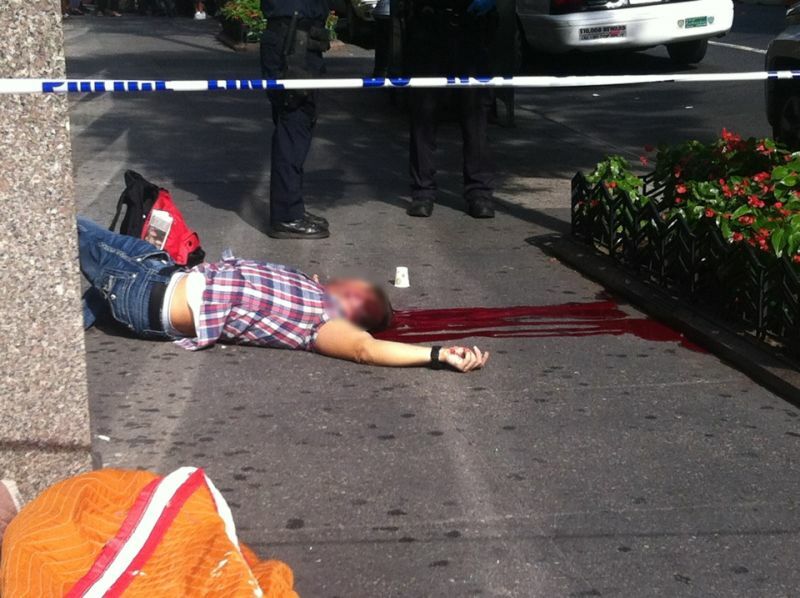 10:48 AM EST: A picture submitted by an anonymous reader shows the body of a male wearing jeans. This image conflicts with earlier reports that the only two people killed in the shooting were a woman and the shooter, who was said to be in a grey suit. 11:03 AM EST: The New York Post has updated its story. 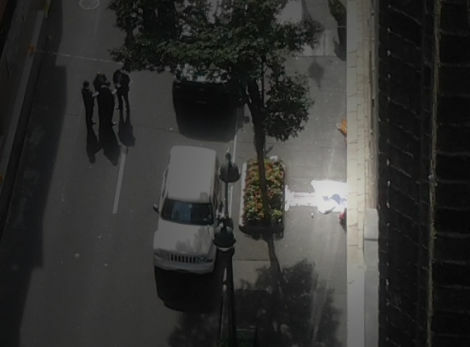 It's now saying that the man in the grey suit "stalked" a colleague down 33rd Street before shooting him dead and then heading toward the Empire State Building, where he opened fire on a corner crowded with morning commuters. 11:15 AM EST: The Onion weighs in, amending its story from yesterday, "Nation Celebrates Full Week Without Deadly Mass Shooting": "UPDATE: Never Mind." 11:24 AM EST: In a press conference, Mayor Mike Bloomberg says some of the victims may have been shot accidentally by police. 11:29 AM EST: The Guardian reports that the dead shooter was Jeffrey Johnson, 53. Johnson stalked his victim, 41, before shooting him three times in the head and body with a .45 caliber semiautomatic handgun and fleeing the scene. A construction worker who'd seen the shooting alerted cops, at which point police approached Johnson only to have him open fire on them. Johnson had worked at Hazan Imports as a women's accessories designer before being laid off last year. 11:30 AM EST: Bloomberg says he's not sure if the construction worker who tipped off the cops is a hero: "I don't know, we all use the words hero. He did what he should have done ... When he saw something, he said something and then turned it over to the professionals." 11:52 AM EST: Bloomberg's press conference confirms that besides Johnson and his initial victim, nine others were injured in the shootout—two women and seven men. Johnson's gun only held eight bullets, and he used three of them on his former colleague, meaning that at least some of the other nine people must have been shot by police. Luckily, none has life-threatening injuries. 12:07 PM EST: Johnson's first victim, initially described as a "coworker," was his former manager. 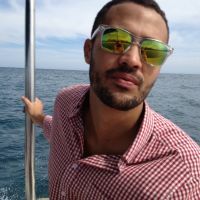 12:20 PM EST: A relative has identified Johnson's first victim as Steve Ercolino, the vice president of sales at Hazan Imports, according to LinkedIn. 12:43 PM EST: Earlier reports about the genders of the victims were incorrect. Reports now say that, besides Ercolino and Johnson, five men and four women were hurt in the shootout. 12:52 PM EST: We've posted GRAPHIC photos purported to be of police inspecting Johnson's body here. 12:53 PM EST: Reports say Johnson was also armed with a knife and an extra magazine with eight more bullets in it. 1:13 PM EST: Contrary to what NYPD Commissioner Ray Kelly said in a press conference this morning, Johnson did not shoot at cops, according to other police officials quoted by the New York Times. 1:59 PM EST: Here's an AP interview with a witness who says she saw people running and thought it was a "celebrity sighting." 2:49 PM EST: The New York Times is reporting that Johnson was 58, not 53. 3:08 PM EST: The Guardian has an interview with Robert Asika, a 23-year-old man who was shot by police: "It just happens, I don't really feel bad about it." 4:13 PM EST: The Guardian is now reporting that all nine civilians injured in today's shootout were shot accidentally by police. Johnson never actually fired on the officers; he just aimed his gun at them.